There's suddenly a surge of interest in failures (technological, entrepreneurial, social) in the press. Curiously, I encounter various of these last week when traveling. First, it was a piece on the Wired UK 05.11 issue which gives an account of various entrepreneurial stories and approaches. The article shows the importance of failures and the cultural lessons one could draw out of them ("Fail fast"...). More specific and full of interesting details and analysis is the April issue of the Harvard Business Review. Although this is a journal I don't read very often, the material was kind of inspiring. The articles addressed several aspects such as the reasons to "Crash a Product Launch", the reluctance from entrepreneurs to learn from failures, the failures-that-look-like-successes, effective strategies to learn from failures, ethical issues, etc. 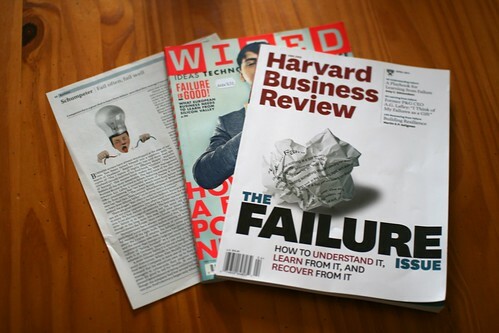 What struck me when comparing both the Wired issue and the HBR articles was that the entrepreneurs/innovators' testimonials were rarely interesting and pertinent... compared to external analysis (meta or not). As if there was some sort of blindness that prevented people from analyzing the problems at stake. "simply “embracing” failure would be as silly as ignoring it. Companies need to learn how to manage it. Amy Edmondson of Harvard Business School argues that the first thing they must do is distinguish between productive and unproductive failures. There is nothing to be gained from tolerating defects on the production line or mistakes in the operating theatre. (...) Companies must also recognise the virtues of failing small and failing fast. (...) Placing small bets is one of several ways that companies can limit the downside of failure. Mr Sims emphasises the importance of testing ideas on consumers using rough-and-ready prototypes: they will be more willing to give honest opinions on something that is clearly an early-stage mock-up than on something that looks like the finished product (...) But there is no point in failing fast if you fail to learn from your mistakes. Companies are trying hard to get better at this. India’s Tata group awards an annual prize for the best failed idea. Intuit, in software, and Eli Lilly, in pharmaceuticals, have both taken to holding “failure parties”. P&G encourages employees to talk about their failures as well as their successes during performance reviews." Why do I blog this? I just completed a book (in French) about recurring technological failures (title and cover are provisional, to be released at the beginning of June)... and it's interesting to see that there's a kind of momentum on these issues. "An internet of things that do not exist"